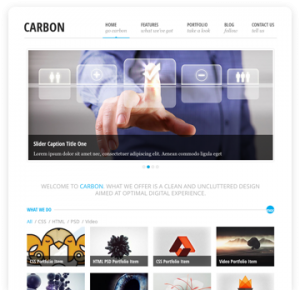 Carbon Light is a free fully responsive HTML5/CSS3 WordPress theme. It is suitable for Business, Service, Portfolio, Blog websites. It has clean and minimalist design that is very easy to customize. It comes packed with a whole lot of code-snippets. Carbon Light is completely White label. It comes in a very clean and uncluttered design on top of a super flexible layout. It is very simple to change all kinds of stuff so you get the design you want. Brand it however you want in no time. The layout is based on a 24 columns responsive grid system. This makes it very flexible and powerful. Works on all kinds of modern browsers and devices. The layout is divided in sections – header, page title, slider area, content, footer. Boxed layout and sidebar examples are included too. When installed the theme will recommend the free OTW Portfolio Light plugin. Once you install it and activate it, it has its own custom post type for portfolio. The portfolio items have lots of features and can be easily categorized. Page templates are available via shortcodes too. Nice templates are available to make your blog look fancier. Post, category, tag management is pretty much following default WordPress logic. There is full online documentation for Carbon Light theme available. Since this is a free item, it is distributed as is without any support included. If you like this free theme please don’t forget to spread the word, like it, share it so other people can try it too. Thanks in advance!